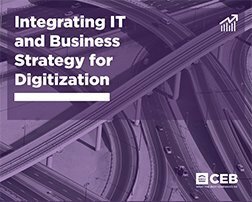 This guide from CEB outlines six shifts in the business content that will shape digitisation efforts to maximise the potential of your organisation. Digitisation leads to a growth in demand that is more personal, meaning customers seek services that align with them as individuals and not segments. By adopting a digital strategy, automation and machine learning move into more complex, less structured activities and employees are free to enjoy greater flexibility, creativity and collaboration.